Michelle Obama's book retitled: American Grown Terrorist's Wife. 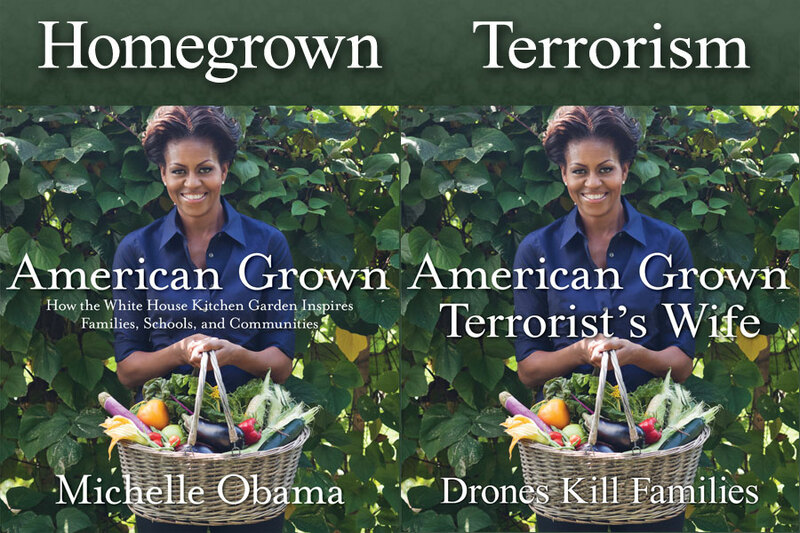 “American Grown: How the White House Kitchen Garden Inspires Families, Schools and Communities.” was announced today as the title of Michelle Obama’s forthcoming book. 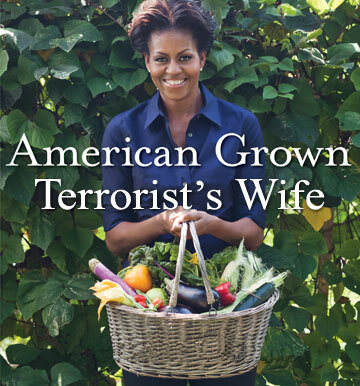 I modified Michelle’s book cover design by augmenting the title slightly. My re-interpretation seemed mean spirited until I realized it was no more mean spirited than the remote controlled killing of kids and calling it collateral damage. I call that terrorism. We would all call it terrorism if any other country did it to our citizens, to our families, to our children. It’s not OK when any country does it and it’s not OK when we do it. 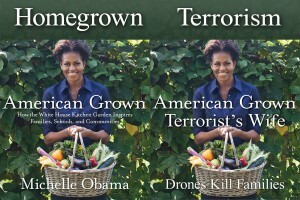 Michelle Obama seems like a nice lady; I’m sorry to have to mess with her feel good gardening book. I really wish our national policy would be focused on nurturing our families, schools and communities. I really wish we could just all grow gardens and make the murder go away. I really do. I posted this graphic to Facebook and caught some flak for it from my friends, mostly with the sentiment that if I have a beef with President Obama, that’s fine, but lay off the First Lady. I know, it feels like a mean spirited cheap shot. That’s why I deleted this from my FB wall within a moment of posting it. I hadn’t realized the photo remained on my photo page. Michelle Obama seems like a nice First Lady, she has two sweet daughters. When the Jonas Brothers attended a White House speech, President Obama said to them, “Sasha and Malia are huge fans, but boys, don’t get any ideas. Two words for you: predator drones. You will never see it coming.” That was last year. Just last week, Reuters reported: Two relatives of an assassinated U.S.-born militant cleric who were killed in an air strike last week in southern Yemen were teenagers out for dinner with friends when they were hit, their family said in a statement on Tuesday. So we not only kill the guy (without due process) but two weeks later kill his kids. A few months back a “targeted” airstrike killed Qaddafi’s son and THREE of his grandchildren. If any country did that to us, we would call it terrorism. Sorry for your “No Like” and I value your honesty and opinion. I know how much you love your grand kids. I know how much “HOPE” I had that Obama would be different, but he’s killed more kids with drone strikes than anyone. That’s just my opinion expressed in a way that I understand many people will not like. Edgy art finds the edge by sometimes going over it. Granted the First Lady has little influence over the President’s policies of killing the family members of his enemies. I would call that terrorism and she’s his wife. Thanks Ned. Yes, killing kids is wrong, even when WE do it. Truth tellers are never popular with those who still believe we are the good guys. See you on Common Dreams – JohnR654. Keep up the good work !